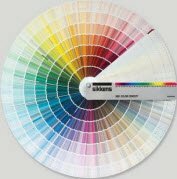 During one of our research activities the theoretical question came up whether finding the closest match in a color fan deck using RGB values would be different from using CIELab values. Obviously with the idea in mind that the Lab space would correspond better with human vision than RGB space. This question occurred to us when we were compiling a report related to cheap color measurement devices to digitally search in color fan decks. These devices carry alluring names like Nano, Node, Nix, Capsure, Muse, Cube etc. 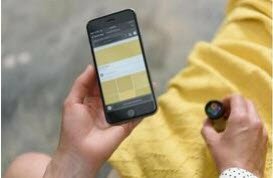 A number of these devices work based on a camera CCD chip that determines RGB values like the Nano and Color Savvy devices. We did not consider the Capsure although it also works with a CCD chip but illuminates monochromatically with 7 LEDs which makes a sort of abridged spectrophotometer. The manufacturers use the RGB values to search in a color fan deck. Obviously they optimize the results towards CIELab space and a modern criterion like dE2000 and they are quite successful in that. So the question if finding the best match in RGB space differs from finding the best match in CIELab space is actually only interesting from an academic point of view. But as researchers we were intrigued and we cut some corners to find an answer. So, if you hoped to find a concrete article to benefit from please stop reading. But if you are a bit nerdy like us we invite you to read the rest of the article. To make it easy for ourselves we used the old dE_CIElab value and not dE_CMC or dE_2000. We thought the conclusions would not be drastically affected. If we assume the CIELab space corresponds optimally with human vision, we can compare these results with those based on RGB. There are different ways to do that but we tried to stay as close to normal practice as possible given the limited time we have available for doing unproductive things like this. For all fan deck colors and test colors the Lab values were calculated from the RGB values using a generic equation (in fact I used sRGB to Lab). Each test color was compared to all fan deck colors (no search smartness here) based on RGB and Lab searching. 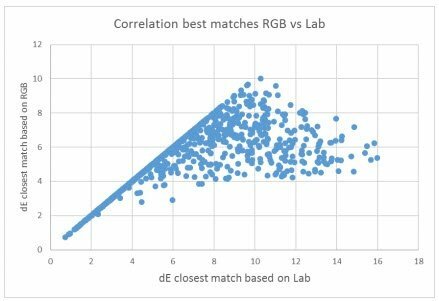 Based on RGB and Lab searching the best matches were counted. Based on the same search methods the nearest best matches were then counted. A criterion of dE = 1; 2 and 3 was used to decide whether there was a match or not. In case of randomly generated Fan Decks about 50% of the formulas found based on RGB were the same as those found based on Lab. In case of systematically generated Fan Decks this was about 60%. For near matches the results differed of course based on the “near match criterion”, dE=1, 2 or 3. For randomly generated Fan Decks between 62% and 88% of the formulas were found based on RGB searching and for systematically generated Fan decks this was between 68% and 88%. However, we thought of another way of interpreting the results. We made an xy plot of de dE values between test colors and nearest fan deck colors based on RGB and Lab searching. From the graph a few observations can be made. First of all, as would be expected dE based on Lab is by definition never higher than dE based on RGB. More importantly, significant differences between the two search methods occur only when dE is higher than 4. Because in almost all practical cases the quality of the required match must be better than 4 CIELab units, this means that there is no big difference for this purpose between search results based on RGB and Lab! Excerpt Industry Report Low Cost Color capture Devices At least 12 Color Metamerism types!